Note: The following tutorial refers to the state as of February 2013 and is deprecated. This method is no longer supported by Google! The advantage is that such hits are more “personally” since you can also see the author. Eventually this also causes more people to visit the website, what i noticed when looking at the statistics of my own website. You need a profile with a picture at Google+. In this profile you have to enter the URL of your website in “Contributor to” (in my case http://arnowelzel.de) as a publicly visible entry. Additionally you have to enter an e-mail address within the same domain as the website (so in my case something with …@arnowelzel.de) and let this address be verified (Google sends a confirmation message to the given address including a link to activate it). After a couple of days you should see your own profile picture in hits at Google. Please note that not every hit is marked this way. 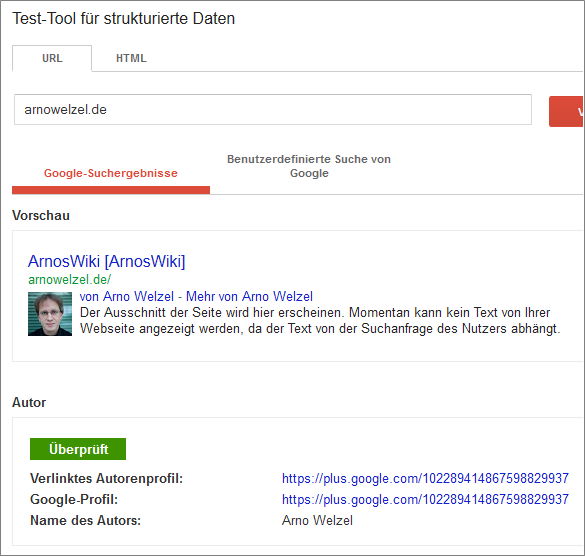 Additionally you can check the authorship statistics in the Webmaster-Tools by Google. At the moment this feature is still experimental (as of February 2013) and can therefore be found in the “Google Labs” section.